A View from Outside: Experience your applications through your customers’ eyes? Customer satisfaction is essential to growth, profitability, customer retention and the very survival of your business. Today’s Web-based applications and the transactions they enable can be unruly and complex, running across an array of platforms from the mainframe out to IaaS, PaaS and SaaS environments. How do you ensure each customer, regardless of geographic location, receives a consistent experience when IT doesn’t even have full control over each step of the deliver process? Managing end-user experience in this environment requires a 360-degree view of the business service from the inside and outside to deliver a composite view of application and transaction performance that helps assure great service. 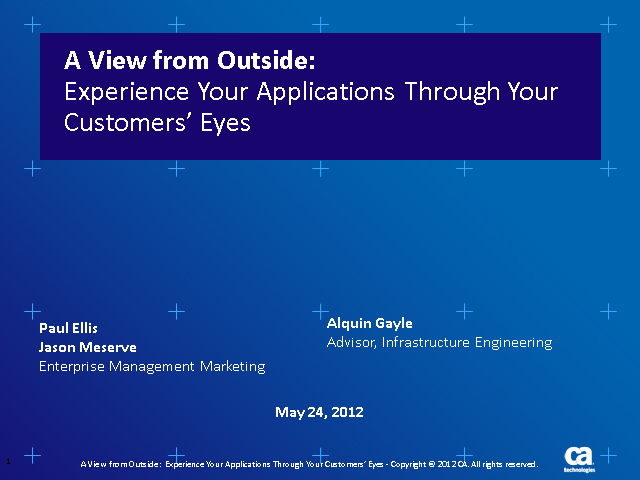 Title: A View from Outside: Experience your applications through your customers’ eyes?